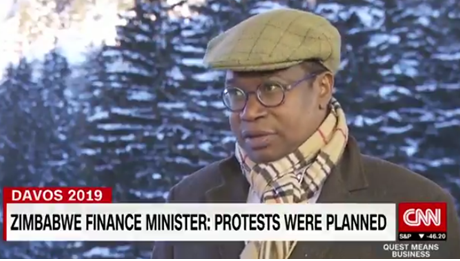 (Reuters) Zimbabwe's finance minister painted an optimistic outlook for his country on Tuesday, despite protests over fuel prices that human rights groups say have left at least a dozen people dead. He also talked up a privatisation programme that has so far seen little real progress. Zimbabwe is the best buy in Africa right now, he said in an interview at the World Economic Forum in Davos. Ncube, a former banker whose appointment last year was meant to signal a new focus on the economy, said Mnangagwa had issued a very clear statement to say that violence is really not allowed, that violence is un-Zimbabwean on both sides. He said any abuses by the security forces would be punished. It is precisely because of the opening up of the democratic space that this (the protests) has happened, he said. There is only one centre of power which is the president. Everyone is behind him.